Produktinformationen "e3d lite Bowden 12V"
We know that not everybody needs the all-metal high-temperature performance of an E3D-v6. We’ve come to realise that there exists a need for a hotend that is reliable, and puts out great prints, but meets the budget of those who are just getting started in 3D printing. Lite6 is our answer to that need. By adopting a PTFE lined, “Mostly Metal” design we’re able to meet what we think is a really awesome price point of 40,00€, for a fully inclusive kit with electronics. That’s a lower price than any other genuine hotend on the market and cheaper than many clones. Lite6 does not supersede v6 - more compliments it, think of Lite6 as v6’s little brother. It’s a lower cost hotend, with a more modest specification, but still a great option for beginners and those on a budget. Read on to find out the key differences and features. The metal bodied construction of Lite6 the hotend makes it incredibly robust and tolerant of accidents that new users inevitably encounter. If you accidentally crash your Lite6 into a print there is effectively zero chance of it breaking. Unlike hotends constructed with PEEK bodies Lite6 is also very tolerant of overheating accidents. Although the PTFE liner may be damaged by the heat, there is no PEEK insulator to melt into a puddle of molten polymer. The stainless steel parts are incredibly thermally robust and essentially impossible to damage with the supplied heater. This means that in the event of cooking your PTFE liner you can quickly and easily swap it out for a new one and return your Lite6 to full functionality. New PTFE liners cost only £0.33! We’ve also re-used as many parts from v6 and the rest of the E3D-Ecosystem as possible, the beautiful polycarbonate fan duct, the proven 30mm ball bearing cooling fan. Most importantly we’re using the same highly optimised nozzles and heater blocks. This means that we’re using tried and tested v6 components to deliver great performance in the most important areas of Lite6. We were concerned that we needed to create something that was low cost, but not low quality. By using a PTFE liner, we are able to relax our need for aggressive thermodynamic control of thermodynamics that is needed in v6. The mostly metal construction and use of E3D-v6 nozzles means that you do not lose out on print quality. The PTFE liner reduces required manufacturing tolerances and contributes to Lite6's exceptional reliability. The core component of Lite6 that makes it different from it’s more capable sibling the E3D-v6 is the new stainless steel heat-sink (a concept that will horrify anyone with a keen understanding of thermodynamics). This means we were able to replace our previous two component system of a stainless heat-break (which are extremely expensive to manufacture), and our aluminium heatsink. This does mean that Lite6 is a touch heavier than v6, with 22g more weight due to stainless being considerably heavier than aluminium. We very very carefully designed the Lite6 heatsink with a specific lathe in mind, using a specific set of tooling. We almost spent more time thinking about the GCODE that the CNC lathe would run, the order of operations, and the cost implications of each operation than we did on the initial design - which, frankly, is boringly simple! Why is E3D creating a mid range hotend? Low cost doesn’t have to mean a poor user experience. We’re known for our all metal high performance hotends, and advanced multi-material extrusion systems. However we see a constant stream of users who come to us after purchasing a hotend, or machine with a hotend already fitted, where the hotend has either completely failed, or has very poor performance and reliability. Particularly low quality clones of genuine products which just haven’t been manufactured properly, and also hotends that have intrinsic design flaws. Some of the products out there are simply dangerous too. The status quo just did not seem acceptable to us. We wanted to take our expertise in manufacturing and hotend design and create an entry level product for new users or users with a lower budget, but still offer an assured level of performance and reliability. 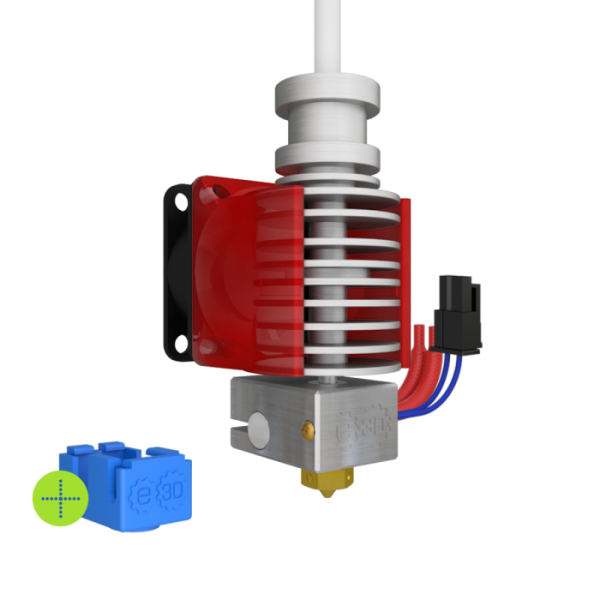 A Hotend option that grows with your needs. We also wanted to allow people who are starting out at a lower budget to have the ability to easily upgrade in the future, so that when the time comes to boost the performance of their printer they don’t have to print a new extruder, or reconfigure their printer. This provides a nice stepping stone into the world of 3D printing with a hotend that has the capability to increase it’s performance according the the users needs, budget and experience. The Lite6 is the latest addition to the v6 ecosystem and because it shares core components and key dimensions with the E3D-v6 you know that your investment is for the long term. The full range of replaceable v6 nozzles are available to Lite6 allowing you to keep a selection of nozzles in your printing arsenal which you can easily swap in and out depending on the application. As well as being able to use standard v6 nozzles, you can also upgrade to Volcano giving you unprecedentedly fast printing capabilities with exceptionally high strength. Because the Lite6 has exactly the same external dimensions as v6 - any mounts that are available for v6 will work with Lite6. Furthermore, when you are ready to upgrade to a full-blown v6, and unlock the full high-temperature performance of your core components you can simply buy the upgrade pack and make the easy switch - you won’t even need to change your HotEnd mount or re-wire your electronics. Weiterführende Links zu "e3d lite Bowden 12V"
Kundenbewertungen für "e3d lite Bowden 12V"
Habe das Hot-End noch nicht ausprobiert aber schon mal ein riesen Lob an E3D und/oder YouPrintin3D für den Lieferumfang, das Teil kam inklusive der neuen Thermistor Cartridge Lösung (kein rumgefummel mit den filigranen Beinchen mehr) sowie einem Silikon Schuh für den Heater Block. Lieferung kam schnell, E3D Lite wird in einem GermanRepRap NEO verbaut. Druckt sehr zuverlässig. Noch keine Probleme bis auf das leidliche Bowdenzug klemmen. Dafür gibts auf thingiverse aber Abhilfe einfach nach e3d lite clip suchen. Das Hotend ist super verarbeitet und liefert tolle Ergebnisse. Der Zusammenbau des Hotends ist sehr einfach und schnell erledigt. Die Druckergebnisse bei der Verwendung von PLA lassen sich sehen. Wenn man eine andere Düse benötigt, ist auch das sehr leicht möglich. Einfach mit einem Schraubenschlüssel bei auf aufgeheiztem Hotend lösen und die Düse tauschen. Super Hotend zu einem guten Preis. Ich habe das E3d Lite als Ersatz für das China-Hotend meines Delta Druckers gekauft und bin sehr zufrieden. Die Aufheizzeit ist wesentlich kürzer, die Temperatur wird besser gehalten und die Drucke sind einwandfrei. Das e3d lite ist das zweite Hotend, dass in meinem Drucker Anwendung findet. Mit seinem Vorgänger, einem Hexagon, habe ich etliche Meter ABS verdruckt, doch mit PLA wollte das All Metall Hotend nicht so richtig. Nach ein bisschen überlegen kam ich auf die Idee mit dem Inliner um PLA zu drucken, so sollte eigentlich die Wärme besser abgeführt werden und das Material nicht schon direkt im Cold-End geheizt werden. Mit dem Bulldog XL als Extruder leistet das kleine Hotend trotzdem anständige Arbeit, 100mm/s druckt es ohne Jam. Die erste Woche mit dem Hotend ist richtig klasse, ich habe noch nie so lange ohne einen Jam, Verstopfer etc etc gedruckt, auch die Layerqualität sieht mit dem e3d lite deutlich besser aus. Ich bin mit dem e3d Lite grundsätzlich zufrieden, es ist ein klasse Hotend für wenig Geld, wie bereits erwähnt hat mich der fehlende Pushfit geärgert (der Große Bruder von e3d bringt doch auch eins direkt mit, warum der kleine nicht?). Außerdem, was wohl mehr an meinem Druckermodell als an dem Hotend liegt, ist der Lüfter + Halterung für mich völlig überflüssig, er passt nicht unter das xcarriage und somit kann ich ihn nicht benutzen. der Pushfit gehört bei der Bowden Version dazu.